the Makerie: the 2013 makerie sewing scholarship! 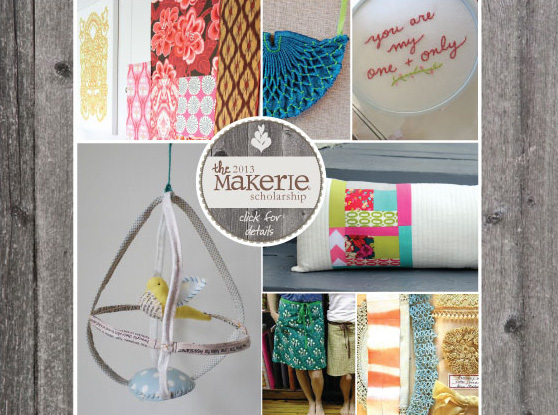 We are absolutely elated to announce our Makerie Sewing Scholarship! The Old Glory Antiques Fair will be generously offering one full Makerie Sewing package (including a travel stipend up to $500) for the 2013 Makerie Sewing event. For the next three weeks, we are accepting scholarship applications via snail mail. We are looking for applicants who embrace the spirit of the Makerie and are deserving of a creative weekend away, but may be unable to make the financial commitment at this time. Our big hearted sponsor of this scholarship, the Old Glory Antiques Fair, is making this all possible. The theme of the 2013 Fair will be "authentic beauty... with a story to tell." Old Glory will be celebrating the art of handmade with a special tribute to a treasured art form, the American quilt. The quilt reflects authentic beauty in every stitch, simply and lovingly telling the stories of the people who created them. To weave in the time honored tradition of quilting, we are adding a handmade element to the scholarship application process this year, as you’ll see detailed below. :: write us a letter (handwritten or typed) under 500 words detailing why you would be a beautiful fit for the scholarship and what attending the Makerie Sewing would mean to you. This can also be a nomination letter, as long as you have your nominee make the quilt block, as detailed below. You don't even have to tell them why they're doing it ~ which is so much fun! Be sure to include your contact information & please be assured that all entries will be kept confidential. :: create a “paper quilt block” in the spirit of Celebrating the Art of Handmade: The American Quilt at the Old Glory Antiques Fair. Please include the quilt block according to the following guidelines with your mailed letter. *French General is offering to mail you paper & fabric scraps! ~create your quilt block to represent yourself – use words, color, pictures, whatever your creative heart desires! We will be using all submitted quilt blocks in an installation at the Makerie Sewing and the Old Glory Antiques Fair. We can’t wait to see what you make! Tue, Jan 15 LAST DAY for post-marked applications to be sent in! Thurs, Jan 31 Scholarship winner notified here on the blog! Awarding a Makerie Sewing scholarship means the world to us and one of my personally most cherished parts of our event. I just can’t thank Old Glory Antiques Fair enough for their incredibly kind generosity in making this all possible. We would be grateful if you would pass this along to anyone you know who might be interested in applying or nominating someone they love, as we truly cherish each and every applicant. This would be a dream! What an opportunity! I have no further words but thank you! Please thank Holly of Old Glory Antiques! She's such a generous soul! Can't wait to see what you make April! I so need this! Plus, we're stuck in the house from hurricane Sandy. I know what I'm doing now that all the prep is done. Hello, I'm having a hard time tracking down an A4 envelope. I've gotten 4.75" x 6.5" and everything very close in between. Is there another size envelope that I can send my essay and quilt square in? Thank you! Thank you so much for this incredible opportunity! I just read about on the French General blog. I'm a book artist exploring ways to incorporate quilting techniques into my handmade journals. I will be mailing in my entry soon! Best wishes to all the other entrants! We're so excited to provide this special chance & extremely grateful to Old Glory Aniques for making it possible! Can't wait to see your entry! Hi, is this open to people outside the US too? Sent in my stuff today! Thank you so much for the opportunity! It will be a wonderful experience for anyone! Two questions. Can the quilt block be made of fabric--no paper? And can we enter more than once? Thank you.